On receiving my first two awards, I was just Tickled Pink. Today, I find myself Tickled Rainbow, for I received not one, but two fabulous awards from equally fabulous sites. There is no “one hue” that can describe my elation now. I am doing belly-flops I am so excited. The cats have left. The dog, on the other hand, is loving this new game, although she is battling to understand the rules of belly-flop. Then again, when has a dog ever needed to understand anything to get full-hearted enjoyment out of it? 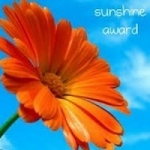 Hey It’s Jet Here most incredibly sent me the Sunshine award. This is truly a great honour and I am astounded by Jet’s generosity. Jet (clever little dog that he is) writes a most entertaining blog from his unique perspective on life. 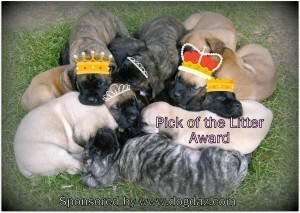 DogDaz have also given me an award – you crazy bunch of welcoming bloggers. This site has brilliant photographs and very entertaining dialogue (details of their award further on). Favorite number: 3, no 7, no 11 – oh stop confusing me here! Favorite Non-alcoholic drink: What is a non-alcoholic drink??? Amarula Cream has cream in it, does that count?. Facebook or Twitter: Would have to be Facebook – never been on twitter, you tweet. My Passion: Oh golly, let me think here, it might be….let’s see….animals? Favorite pattern: Those one’s that make you inadvertently think of hearts (aren’t I just the soppy one). Favorite Day of the Week: The one’s on which we win awards, of course. Whew! That’s it for all the Thinking and Work, other than to nominate a couple of my favourite sites. There’s a good chance I am supposed to nominate a specific number of sites but, unfortunately, I haven’t been around all that long (real spring-chicken here), so it’ll just be a few. I hope it makes your day guys – it certainly made mine! I know, I know – all of you have probably received billions of awards, including this one, but I thought you might at least want to know that I thoroughly enjoy reading your blogs and think you are all Fantastic. To Collies Of The Meadow – who really needs a little sunshine at the moment – God bless you and give you strength. To Wayward Dogs – for all your incredible work, helping lost and wandering dogs – we appreciate you. To I Adopted a Dog – NOW WHAT – thanks for adopting and letting us all share in your adventures. To Paws to Talk – for always keeping a smile on my face with your unique answers to difficult questions. To Chancy the Gardner – for your fantastic site with its’ own special point of view. To Bassas Blog – for your hilarious and brilliant photographs and your unique outlook on life. 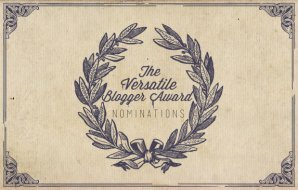 To DogDaz, who is jointly responsible for my absurd “belly-flopping”, as they have listed me as their Pick of the Litter and awarded me the Versatile Blogger Award. I love your site and am deeply grateful for your generosity and kindness. The other day, Raising Daisy at http://raisingdaisy.wordpress.com wrote an article in which Stink Bugs were featured as a toy/irritant/nightmare for Daisy. It got me thinking. Well, of course it did, bearing in mind that each incident in my life is now inadvertently converted into blog format. Anyway, it had me remembering a scenario a couple of years back. My neighbour’s place had been broken into. No-one was home, so I called the police who, somewhat remarkably, came rushing around. As they approached my residence, I heard a truly blood-curdling SCREAM emanating from her house. Now I know there are “baddies” out there and my adrenalin starts to pump. I rush instantly to my neighbour, ready to rescue the damsel in distress from lurking danger. I have no idea what I planned to do (maybe slap them about with a powder puff or something). The police, weapons drawn and all action / tough-guy demeanor, rush the place from behind me. We are all ready, guns and powder-puffs blazing, to take on the criminals. It turns out that my neighbour had returned home, just minutes after my call to the police, completely unaware of the break-in which had occurred on the other side of her premises. On stepping into her entrance hall, she had been confronted with the greatest terror Johannesburg has to offer. Fly the crime, fly the news reports any international reader may have seen. She had stumbled straight into the path of a PARKTOWN PRAWN. She could care less about the pending doom of criminals. All she could think of was getting the police to rid her home of the creature. The police were flabbergasted. These are the most frightfully fearsome looking creatures, that have a nasty habit of jumping stupendous heights and lengths to land their horribly spike covered legs into your flesh. Just creepy! 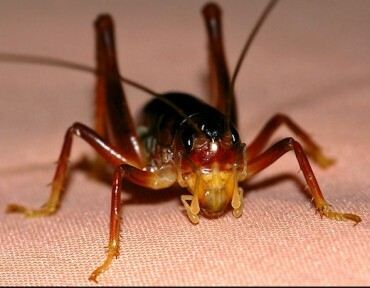 I found a rather amusing write-up on these spine chilling creatures at http://www.whatsupjozi.com/2012/jozi-joburg-info/the-legend-of-the-parktown-prawn/818 The picture is courtesy of this webpage. I know, I know, this appears to have nothing to do with pets. However, never fear, there is a link up. It follows into my latest money making scheme. I have decided to rent out my fear-deficient husband and mad Baby Boy Sabre cat. Sabre seems to think that Parktown Prawns are the best toy nature ever invented. Being the perfect hunter that he is, he catches them and then, to amuse himself and terrify his mother, he brings them inside where they pounce and perform around the place whilst he gets to play hunter over and over again. I react like any other level-headed, responsible mother by screaming for hubby, whilst performing death defying acts of gymnastic proportions to avoid the onslaught of the enemy. My fearless husband (bless him) is the first person I have ever encountered that does not mind these creatures. So, with Sabre’s instinctive ability to catch them and hubbies fearless removal thereof, I find my garden no longer a resting place for evil creatures with more than four legs (anyone who knows me or has been reading this blog will know that, although I love animals, my loves limit is reached at 4 legs and anything beyond that has me turn instantly into a real girl). So, here’s to my latest “get rich quick scheme”. All I have to do now is convince my husband to be a “man for hire”. Everyone has been so supportive regarding my attempts to find Chocy the Ridgeless Ridgeback a home and I feel guilty at not having given an update yet. However, that WORK thing got in the way yet again. Am I a soppy lover-girl or what? The day was hilarious and should go some way towards understanding my heartfelt need to play middle-man between Shelter Owners and People (yes, I have listed them as separate beings). Please don’t get me wrong, I mean absolutely no disrespect. I adore the marvelous people who give up their entire existence to help the animals and, yes, you are right, not all Shelter Owners are the same but, nonetheless, some need the help. Let’s face it, if the norm is to work a standard job with a secure salary each month, then we are not, here, talking about normal people. The day started with a call from the shelter, whilst we were already driving there, saying they will absolutely not adopt out a dog to a commune. I do understand this and the need to provide an animal with a stable and responsible home but I had explained to them that this was not a typical commune. The chap that wants the dog, owns the house, understands that the dog would be his responsibility, has a stable job and is an animal lover. The other guys in the house are his long term buddies and they are a close-knit bunch. 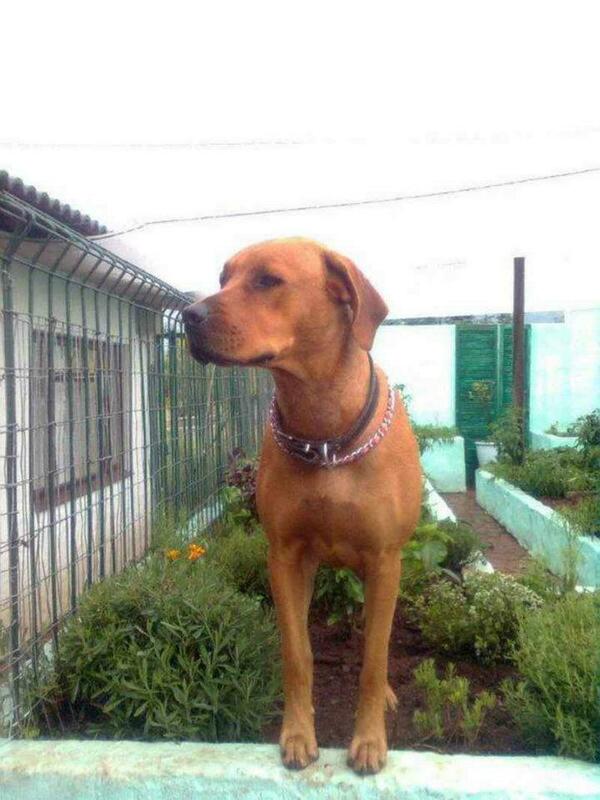 Rhodesian Ridgeback’s are not easy to adopt as they require a lot of exercise. This guy specifically wants to run with the dog. Fabulous! 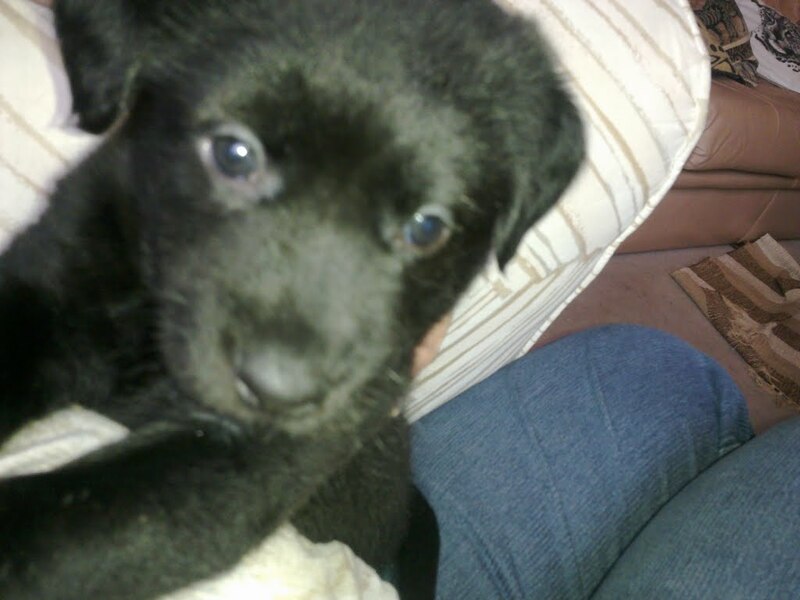 So, after much persuasion, I take the chap’s Mom through to meet the dog. She loves Chocy. What a delightful, sweet, soppy natured animal. On our return, she phones her son, who is so excited he immediately leaves work to go and see her. We, for our part, jump back into the car to fetch his other dog, so that we can make sure the two will gel. We scream back (ok, not safe with a dog – we slowly make our way back) to the shelter, with a borrowed collar and lead that are too big (had no idea where son keeps these). Chaos one – in our hurry, we give son the wrong street number and he inadvertently visits complete strangers (and waits for us there!!!). Chaos two – son finds us, dog sees son, dog gets very excited and immediately slips through collar and makes a break for it, running circles in the road. Chaos three – shelter owner brings out very large Ridgeless Ridgeback to meet very, very small and timid Jack Russell. Jack Russell immediately has a frothy fit and figures attack is the best form of defense. The Shelter owner had been concerned about Chocy with other dogs but she gave all the right signals, being interested and friendly but turning her head away from the aggression – what a star! Chaos four – shelter owner questions (or should I say, interrogates) son, who gets so flustered he says practically all the wrong things. Dog good for guarding (never to be said to a shelter owner). Previous dog run over by car (definitely never say that to shelter owner – and it wasn’t even his dog!). As son had to return to work and was wearing a wool jersey, he also began picking off Jack Russell hairs like he had some form of cleaning disorder (I think the interrogation nerves were getting to him). Shelter owner eventually agrees to do a home visit tomorrow. We pile ourselves back in the car to return the Jack Russell and get back to WORK (see, there it is again, that 4-letter word). Chaos five – Jack Russell, after such a hectic outing, promptly vomits all over the car floor. I left. So to round off, we still have no idea. If it is meant to be, then the home visit will go better. If not, then another dog is obviously awaiting this particular home. I would have sent this blog earlier but I have been wrapped up in chilli – but that’s another story, for another day. The Stats are in – Insanity Rules! Well then, for Monday Mischief (this is a Monday Mischief Blog Hop, after all) the stats are in and the unanimous results show that Insanity Rules! I am pleased to announce that I am in extremely good company in this mad-house. Not one single vote for my addiction being abnormal. We had a 100% hit rate on “Normal” and I find myself now truly entrenched in the bloggersphere. I am delighted. The animals are delighted (well, they would be, if they were awake but cat-naps and doggy dreams seem to have taken over here) and we will continue foraging for fuel to super-charge the addiction. Tomorrow is an exciting day for us. 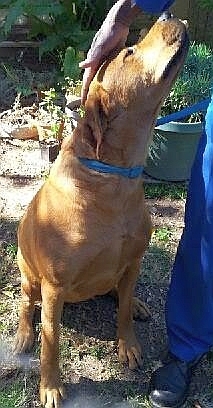 I have, hopefully, found a good “forever” home for Chocy, a Rhodesian Ridgeback that has been at the Woodrock Animal Rescue Shelter for over 4 months now. Chocy is actually a Rhodesian Non-Ridge though as, somehow, she managed to misplace her RIDGE!. No-one seems to be able to find it! 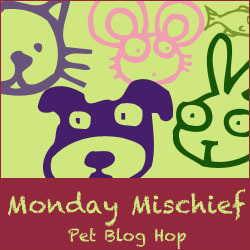 Guess that’s “Mischief” enough for Monday. How many other dogs can say they lost their Ridge? Chocy was a stray, rescued from an informal settlement and certainly had a hard start to life. We are holding thumbs and paws that the potential adoptees fall head over heels for her tomorrow. I’ll be sure to provide updates in my next blog. Happy Blog Hopping to all. Monday Madness Rules!!! Can Addiction Affect Your Work? By now, we all know that my Blogging Addiction Level has reached extraordinary levels. This has been fueled by the intensive training program, into which I was somewhat unknowingly conscripted. It would appear that the training is in overdrive and my Rewards/Awards for desirable behaviour are increasing. Don’t get me wrong, I love my addiction. The problem I am experiencing, however, is that work (that nasty 4-letter word that keeps getting in the way of pleasurable experiences), seems to be expecting me to maintain a level of responsibility. I need assistance and, to this end, I have added a poll. I am now reaching out to my fellow bloggers and friends, to see if there is a consensus regarding this perceived insanity encounter. Now, on this subject, I will have to admit that – dare I mention this in polite company – WORK got in the way of my ability to keep track of my Addiction. As such, I have only now noticed that I have, once again, been Rewarded for my Addictive Behaviour. 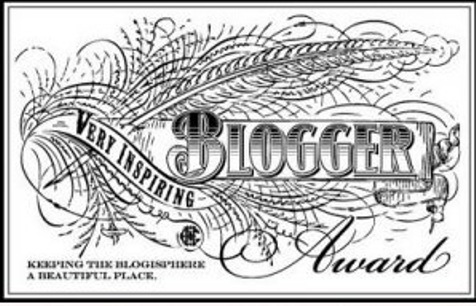 The wonderful Wayward Dogs (http://waywarddogs.com), who have dedicated a site to helping lost dogs find their owners, or new “forever” homes, have very kindly awarded me with the Very Inspiring Blogger Award. I am tickled pink! I LOVE animals – who’d have guessed? God is good (although sometimes our priorities seem to differ. I assume he knows what he’s doing and I’ll look back on my challenges with an “Ahh, that’s why” moment). 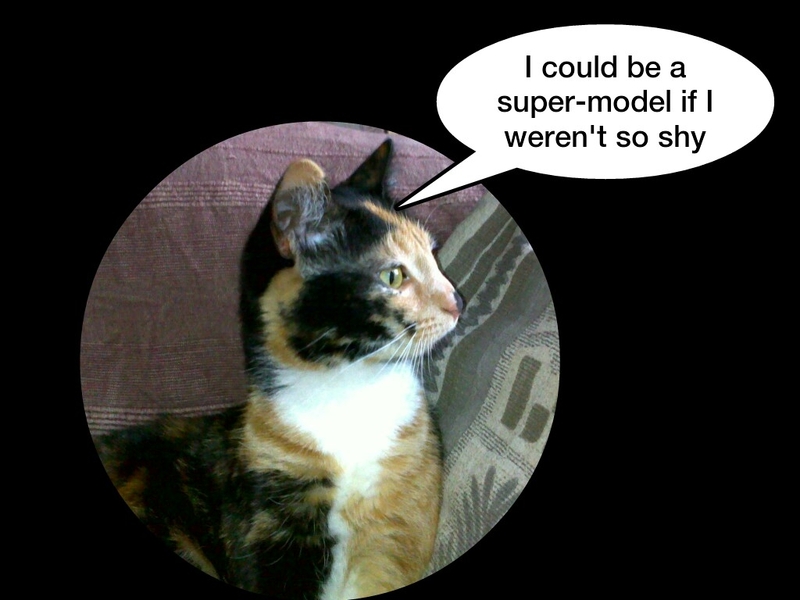 Jittery Jangles – Supermodel? I think so! I’m starting to think in Blog! Is this normal, seeing everything in small bite sized pieces of information to put into the next post? I fear I have joined the ever growing STS (society of the insane). I must admit, though, I rather enjoy the company here. My ever growing hoard of furry critters don’t seem to mind either. They are rather enjoying the attention. 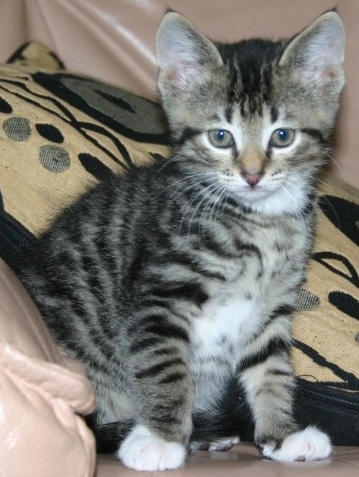 So Jangles arrives at home and I am excited beyond belief. What does she do? She disappears underneath the bed for weeks on end. Not quite how I had anticipated this to go. She had her own room and we gave her space to settle but the poor thing was so frightened and traumatized that it took weeks before we could even get to pet her. The fact that a dog existed in the house certainly didn’t help matters, although we kept them well apart. Just a point regarding what her previous home must have been like, remember I said she was returned to Cat-A-Holics because she was “weeing in the wrong places”? Well, even in her most fearful state, she has done nothing but use the litter tray to perfection! Makes one think, doesn’t it? So sad, the most beautiful cat in the world, with a hugely loving personality, too scared from past experiences ever to be seen by anyone but my husband and myself. However, although that still remains the fact and, even though it has taken over a year and half’s worth of patience, she has come out of her shell remarkably. She has finally realized that play time is just great and love is the best thing ever!. Funnily enough, the only other person whom she allows to touch her is my “I’m not a cat person” Dad. From his side, not a visit goes by without him saying “I just have to go and find Jangles to say hello”. Hmm, I think he might just be a convert. We love you Collies – Thanks! Now, bearing in mind that with regards to the training of our four-legged friends, or two-legged for that matter (never tried with six or eight – I have an illogical fear of those) I believe strongly in the “reward” based system. Reward the behaviour that you want. Reward / Award, sounds the same to me and what do you know, looks like I’m being trained into my addiction. Reward the behaviour you want with an Award! I like it! Finally, an update from Sarah-Bell’s Mom! After having successfully accomplished her master mind theft of thyroid medication, supposedly safely stored in a closed cupboard, she was arrested by her mother and immediately delivered to doggy jail, in the form of the veterinary clinic, where she was charged with “destruction of property” and “willful bodily harm to self”. Her sentence was set at one night in jail, with needle torture (for the purposes of a drip) and life-time probation. Although we are delighted that she has now done her time and has been released, we are fearful that she is likely to revert to her life of crime. This is NOT her first offense. She has a previous sentence of “malicious razor-blade eating”, along with numerous, less life-threatening “destruction of property” charges. 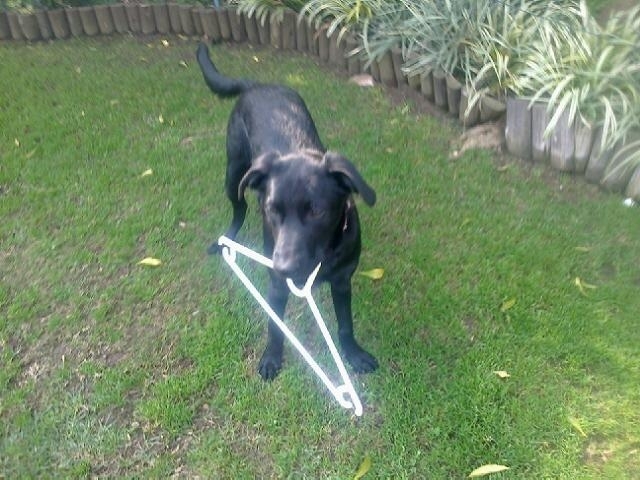 Her latest mug shot, sent courtesy of her Mom, shows her nonchalantly beginning to eat a clothes hanger. What do you think her chances are and do you believe that Probation is a sufficient sentence? It’s never as easy as it looks! It is so easy to forget the challenges of raising a puppy. Once they have grown up and are behaving like little angels, the human brain seems to go into its’ survival mode, blocking out the memories that are too difficult to cope with. 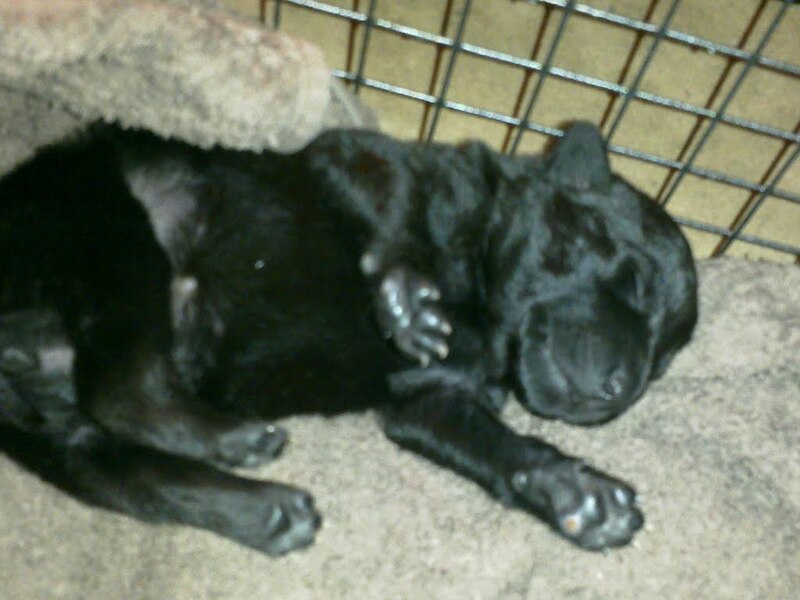 Early this morning, in the midst of a really good dream, I was awoken by a frantic call (well, the call itself wasn’t frantic, the caller was) from the wonderful woman who adopted Sarah-Bell (again, named by basket-case husband), the puppy I took in at 1 week old and bottle fed. Sarah-Bell is now a rather rambunctious 6 month old, with quite a brain on her. Appears she has now figured out how to open cupboard doors of any nature. She managed to open a cabinet, steal her Mom’s thyroid tablets, open the bottle and eat the whole lot. Not having had anything to do with thyroid medication, I really don’t know how dangerous these might be. As they increase metabolism, I am assuming there could be danger of seizures, etc. We now have the animal ambulance on standby whilst she is monitored rather closely. How cute am I now that my eyes have opened? If there was the slightest chance that she hadn’t eaten the entire contents of the bottle, I guess her Mom would not be panicking quite as badly but, as she has been able to consume the greater part of two leather couches already, I should imagine a small bottle off pills would be child’s play for her. I’ll keep you updated as to how much “metabolism increase” an already hyperactive puppy can handle as we find out more. In the meantime, maybe some of my rather knowledgeable fellow bloggers could enlighten me as to the effects of thyroid medications on a dog.